It’s hard to imagine what life would look like without electricity. From the computer you’re probably reading this post on, to the lights you turn on when the sun goes down and the temperature control you rely on to stay warm when it’s cold out, electricity is one of the integral components of daily life for millions of people across the world. With so many systems relying on uninterrupted access to electricity, what happens if the power suddenly goes out? If an event occurs that flicks off the electricity supply, the situation could go south pretty quickly. It might even become a matter of life or death – that’s how much we now rely on electricity in the modern world. This dependency on power has ultimately become one of our biggest strategic weaknesses. With this in mind, one event that’s really worth being prepared for is an EMP. But what the heck – you might ask – is an EMP anyway? The term EMP, or ‘electromagnetic pulse’, has been getting a lot of air time lately, mostly because of nuclear blast) but in reality, an EMP event can come from a range of sources and has the North Korea upping the nuclear threat game (EMPs are one of the potential after effects of a potential to cause massive chaos and disrupt everyday life on a mega scale. While it’s debatable whether a nuclear weapon induced EMP blast poses the most imminent threat, EMPs can also come from a number of alternative man made and even environmental sources such as solar flares. While the risk of an EMP event may feel slim, given the potential outcome if it were to happen, it pays to be informed and prepared, just in case. There’s a lot of information out there about EMPs, both real and fictional and while there are some sources of really useful info you can just as easily find people exaggerating the effects or downplaying the significance. This guide will walk you through everything you need to know about electromagnetic pulse preparedness, covering the basics of how, what, why and where, through to actionable advice to help you prepare for an EMP related incident to minimize the disruption (and destruction) that could result. It’s time to leave the world of science fiction at the door and get real about EMPs – let’s do it. 1 What is an EMP? 2 What are the main causes of an EMP? 3 What are the effects of an EMP? 4 Can I protect my Electronic Devices from an EMP? An electromagnetic pulse, also called ‘transient electromagnetic disturbance’, refers to a short burst of electromagnetic energy that can cause severe disruption and damage to electronic equipment in the vicinity of the burst. Basically, all electronics get fried. While this might not sound like a big deal, in a world where our lives depend on highly complex and interconnected systems, infrastructure and equipment that all rely on electricity for power, any disruption to the power grid has the potential for huge disruptions that will ultimately affect everyone. If an EMP were to occur, it might result in a relatively short disruption to power or it could lead to a total power outage with a lot of very angry people without heat, power or the internet (to name just a few things that rely on electricity). What are the main causes of an EMP? There are several major natural and man made sources that are known to generate the effects typically associated with an electromagnetic pulse. Lightning strike – a lightning bolt is basically a huge current of electricity followed by pulses of decreasing energy. Electrostatic discharge – two charged objects coming into close proximity can cause electricity to discharge. Meteoric EMP – the electromagnetic energy discharging from either a meteoroid hitting a spacecraft or a meteoroid explosively breaking up when passing through the earth’s atmosphere. Solar EMP – when a burst of plasma and the accompanying magnetic field violently bursts from the sun sending EMP-inducing particles towards the earth – because this happens from time to time. While a naturally caused electromagnetic pulse is almost impossible to predict in the short term, they don’t stand in isolation as the sole source of these kinds of events. There are a wide range of man made causes that could potentially lead to an EMP and it’s worth knowing what these look like. There are multiple instances where an EMP is triggered by civil infrastructure failures or malfunctions, such as power line surges can also cause chaos with widespread effects on the grid for hours and potentially days. Perhaps the most well-known man made scenario, however, comes in the form of an EMP attack caused as a direct after-effect of a nuclear detonation of some kind. In this instance, the electromagnetic burst which results can take the form of what’s known as a ‘NEMP’ (Nuclear Electromagnetic Pulse) or a ‘HEMP’ (High-Altitude Electromagnetic Pulse). In the case of a HEMP attack, due to detonation at high altitude, a secondary pulse can be triggered due to the interaction of particles with the atmosphere and magnetic field of the Earth. What are the effects of an EMP? The immediate after-effects of an EMP will be damage to electrical equipment and infrastructure. Large events can knock out the power grid and communication network, and even damage any personal electronic items within the pulse radius, like a laptop. Just another reason to always backup. If you’ve ever had the power go out you’ll know how important it is to be prepared. The risks of a serious EMP event are much more far-reaching and could see significant areas without power for days, if not weeks, at a time. Unless the heating and lighting in your home run on propane or another biofuel source such as wood or coal, you’re looking at the potential for no lights and appliances until the situation is resolved. From laundry and cooking to heat and light, the effects of this should never be ignored and can be easily prepared for with enough foresight ahead of time. While the primary effect of an EMP will be electricity related, it’s the potential follow-on events that would perhaps cause the most disruption to society. In a scenario without transportation or a means for grocery stores to keep food fresh, existing (and often exceptionally fragile) logistics supply chains will likely break down quickly. Couple this with a lack of ability to communicate due to cell networks going down and radio/tv going off the air, and you’re looking at a classic recipe for massive social unrest. This scenario could also be compounded by a breakdown of healthcare provision, with potential after-effects also striking emergency responders and utility companies (think machines shutting down and nobody arriving to run and maintain equipment), with all of these critical services reliant on electricity to function effectively. Can I protect my Electronic Devices from an EMP? The short answer to this question is yes – sort of. While it’s absolutely possible to protect electrical devices from the effects of an electromagnetic pulse, the question really then becomes one of practicality doing so across the entire remit of your electronic equipment, and when it comes to an EMP attack or incident affecting the entire grid, the exercise becomes redundant in the longer term anyway. With that being said, it can be useful to know the options for shielding against an EMP, if only to get to grips with some of the key principles. One method known as electrical shielding basically utilizes an externally braided ‘shield’ surrounding an electrical cable. This shield prevents the cable within from being affected by an EMP, by directing the current into the ground and preventing potential damage. On a larger scale, the application of a device such as a Faraday cage can be used to protect any electronic devices contained within. There are a couple of ways to go about putting together an emergency Faraday cage that would effectively allow you to quickly store all of your smaller electronic devices for protection if you knew an EMP event was imminent, including re-purposing a galvanised steel trash can to do the job. If you have the time, space and resources to do it, assembling a Faraday cage like the one mentioned above is an excellent way to act as an ‘ark’ for saving essential small devices if you have advanced warning that an EMP is imminent. The general rule of thumb here is anything electrical that fits, should go here with battery operated devices taking priority. Make a list of these items including where they’re located in the house and keep it to hand should you need to grab it and go. If you find yourself dealing with the after effects of an electromagnetic pulse event, the timeline of issues will almost certainly take the form of the following trajectory or one closely resembling it. 1. Immediate effects Whether you’re at home, in the office or running errands, during an EMP attack or incident, the immediate and most pressing threat will come from the loss of power to all devices, appliances and, well anything that runs on electricity or has a requirement on it to start up. We’re talking about lights going out, refrigerators turning off, phones dying, vehicles not starting. If you’re away from home when this happens, your primary focus needs to be on getting home or to your pre-determined location for implementing your plan for this type of event (more on this later). Again to emphasize this point – if you’re in an area or environment that’s not your home base should this situation occur, your priority is to evacuate calmly but quickly and to expect the unexpected. If you find yourself at work or in the car when an EMP hits, the priority is to get home. When this happens, you’re likely to find yourself travelling on foot (With road traffic and public transportation out of action) This is made infinitely easier with the help of a Get Home Bag or Everyday Survival Kit containing the essentials to help you deal with the adversity of the situation and to extricate yourself from it as safely and quickly as possible. While the most obvious effects may appear to be lights out, trains not running, no cell coverage etc, depending on the severity of the situation, things ranging from airliner navigation systems to power plant safety systems may be at risk from a major EMP. You’ll effectively be in unknown territory should this happen, so it’s imperative that you remain alert to everything going around you in the immediate-short term aftermath of an electromagnetic pulse. The next threat following an EMP will likely come in the form of mass public confusion and panic (again, mostly relevant if you’re away from home or live in a built-up area). Expect that the reactions of those around you to the events listed above may be far from calm and collected as fight or flight kicks in with the majority of people. One of the best things you can do in this situation is to keep your head when those around you are losing theirs, implement your plan and get out of there safely. 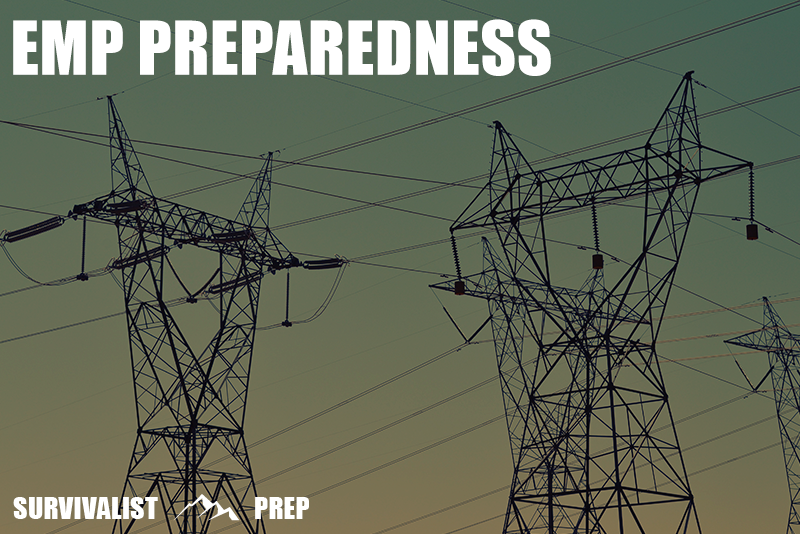 As with all of our preparedness guides, we reference as many expert sources, real world user reviews, and opinions as possible so we’re able to provide the most relevant and educational information on how to prepare for an EMP event. Knowing how to prepare for an EMP event is ultimately a highly personal activity with individual needs and preferences sometimes varying considerably between people, locations, and specific situations. With these considerations in mind, this guide looks to provide advice on our own opinions of how to prepare for an EMP, however, it’s always important to carry out your own due diligence to find the best solution for you when developing a strategy, plan, and solution that’s perfect for your situation.